Avoiding – and Surviving – a Social Media Crisis, a four-hour class geared for business people interested in how to use social media to answer consumer issues and prevent communications mistakes. 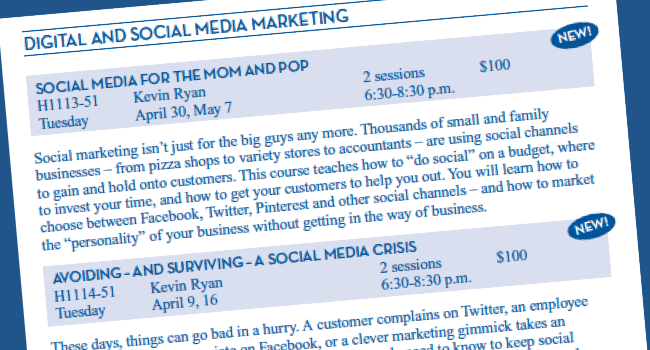 Social Media for the Mom & Pop Business, a four-hour course on the essentials of social media marketing for small and family businesses. We look at how to “do social” on a budget, where to invest your time and how to get your customers to help you out. Put Your Personal Brand to Work, a two-hour class that examines how professionals can use social media tools to capture attention, enhance their reputations and increase opportunities. All sections begin in April. Hope to see you there.